In a climate of national and international health and social care reform, there is increased emphasis placed on partnership working across public, private and third-sector services. Greater integration of services brings many benefits but, for managers and leaders charged with working with other agencies and professions, partnership working can prove challenging. As part of a series of resources that have been designed to offer practical support for those working in health and social care, this short but comprehensive text offers an insight into some of the challenges of leading and managing collaborative practice across health and social service sectors. Dickinson and Carey focus on policy trends, research evidence and issues encountered by leaders and managers in interagency settings. This is coupled with the identification of a series of frameworks and concepts that can support more effective leadership and management in the context of joint working. 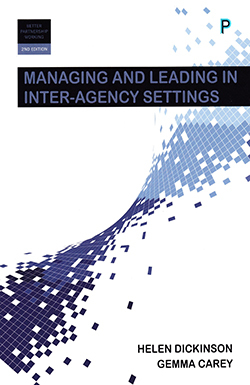 The authors conclude their account by providing a succinct summary of policy and practice recommendations for navigating the challenges of interagency collaborations. This pocket-sized text is a useful source of reference for all professionals responsible for health and social care delivery.